NOVEMBER/DECEMBER 2017 | www.broadbandcommunities.com | BROADBAND COMMUNITIES | 35 AK A helped eight of the manufacturing and engineering companies learn to use the internet to research and approach new markets so they could become less dependent on coal and less centered on eastern Kentucky. For example, an engineering firm that had previously specialized in the coal industry learned to market its services to construction firms and municipalities, and some machine shops broadened their ranges of products and services. Scott Broughton, the center director for AKA, explains that AKA's growth management program teaches companies to identify potential customers through a systematic approach that involves searching the internet for data about market size, marketplace trends, competitors' reviews and other relevant information. He says, "In the past, these companies didn't have that capability, and there was a lot of guesswork. Now there's a tool to help them identify customer needs." Poor internet access can be a stumbling block for companies trying to get into new markets, Broughton says. Another difficulty is that small companies generally do not have full- time staff dedicated to growing the business. e burden of learning and applying internet technology tends to fall on business owners, who already perform several different roles. (As Broughton puts it, "e owner might be on the shop floor, welding.") Still, if business owners recognize that they need to find new markets and are proactive about the effort, they can usually succeed. "e program isn't just about growth but about changing the culture to a culture of growth," Broughton says. 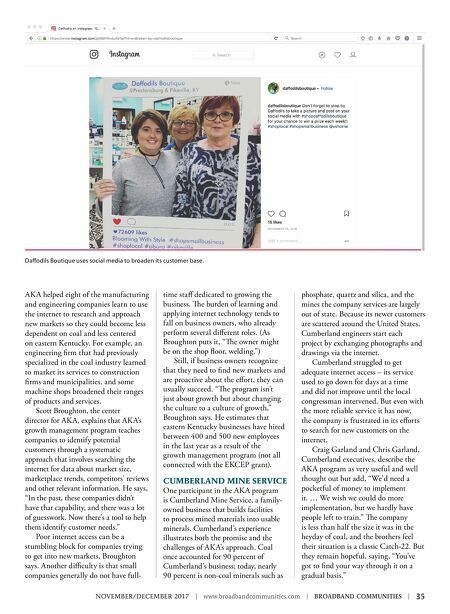 He estimates that eastern Kentucky businesses have hired between 400 and 500 new employees in the last year as a result of the growth management program (not all connected with the EKCEP grant). CUMBERLAND MINE SERVICE One participant in the AKA program is Cumberland Mine Service, a family- owned business that builds facilities to process mined materials into usable minerals. Cumberland's experience illustrates both the promise and the challenges of AKA's approach. Coal once accounted for 90 percent of Cumberland's business; today, nearly 90 percent is non-coal minerals such as phosphate, quartz and silica, and the mines the company services are largely out of state. Because its newer customers are scattered around the United States, Cumberland engineers start each project by exchanging photographs and drawings via the internet. Cumberland struggled to get adequate internet access – its service used to go down for days at a time and did not improve until the local congressman intervened. But even with the more reliable service it has now, the company is frustrated in its efforts to search for new customers on the internet. Craig Garland and Chris Garland, Cumberland executives, describe the AK A program as very useful and well thought out but add, "We'd need a pocketful of money to implement it. … We wish we could do more implementation, but we hardly have people left to train." e company is less than half the size it was in the heyday of coal, and the brothers feel their situation is a classic Catch-22. But they remain hopeful, saying, "You've got to find your way through it on a gradual basis." Daffodils Boutique uses social media to broaden its customer base.